Corey Seager took the league by storm last season. Being the face of the Dodgers for the future, Seager has already become one of the best players in baseball. I have mentioned it a thousand times before, and it applies here again, I am a massive fan of the Dodgers. 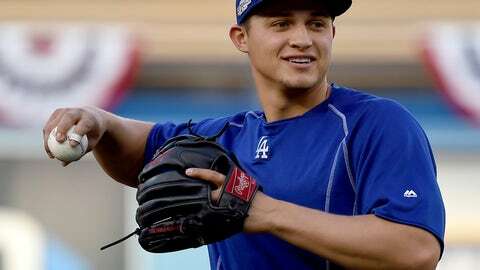 More than that, I am a massive fan of the young Dodgers players I have seen develop – Corey Seager standing out the most. Justifiably so as well, because Seager was easily the best rookie in baseball last season and one of baseball’s best overall players. Seager was voted NL Rookie of the Year unanimously and was a top-three finalist for NL MVP. Although we all knew Kris Bryant would win this award, Daniel Murphy barely edged out Seager for second; having one first place vote opposed to Seager’s zero. The statistics are outstanding as well, as they resemble a veteran in his prime, not a 22-year-old kid. I guarantee if the league wasn’t swarmed with recent young phenoms like Mike Trout and Bryce Harper, this performance would have been insanely more impressive. Seager slashed a .308/.365/.512 line, slugging 26 home runs and 72 runs batted in. If Seager would have batted primarily in the three-spot behind Justin Turner he likely would have surpassed 100 runs batted in. Seager compiled 194 hits and was fifth in Fangraphs total WAR for batters last season with 7.5. Seager actually led all of baseball’s shortstops in WAR, leading other young guys such as Francisco Lindor and Carlos Correa. Seager added that he is still in the process of working on his swing, and that he feels it could be much better. Hearing a 22-year-old kid who batted .308 in his first full year in the majors talk about fixing his swing is crazy. Although he is being extremely humble, Seager must know that he already has one of the prettiest swings baseball has to offer. A good indicator of this is how hard Seager consistently hits the baseball. According to Fangraphs, Corey Seager was 14th in “hard” contact percentage last season, also having the fourth lowest infield fly ball rate of qualified batters. If Seager is still improving his swing, then opposing pitchers should have fear. Seager continued to prove that he is one of the best hitters in baseball and he is only getting better. Natural progression is expected in young players, but a new Seager with a revamped swing may be too much for pitchers to handle.